Thirteen years old and a full-fledged artist. Norwegian treble Aksel Rykkvin is truly phenomenal. Not only has nature and thorough training given him a voice that is crystal clear, perfectly pitched and heavenly beautiful, but also a technique that allows him to do whatever he wants, coloratura and impeccable runs for instance. On top of all this he is a sensitive interpreter who appears to understand the songs and arias he performs. He has the dramatic ability to make Oberto’s aria Barbara! Io ben lo so a really stunning experience. It is almost unbelievable and it is authentic as well. At the premiere in 1735 the role was sung by a boy soprano Aksel´s age – William Savage. The often heard Lascia ch’io pianga, one of Handel’s most beautiful melodies, is on the other hand inward and noble – and tastefully embellished. These are two extremes and they are magical but pick at random any track on this disc and you get the same rewards – from the opening Jauchzet Gott in allen Landen to the concluding Alleluia from Exsultate, jubilate, written for an Italian castrato. In Eternal source of Light Divine he even challenges David Blackadder’s trumpet. It is marvellous. Let the bright Seraphim from Samson — a stumble block for any soprano — is riveting. Most remarkable of all is maybe Cherubino’s two arias from Le nozze di Figaro. A trouser role – a woman playing a young boy – and in the theatre it can sometimes be a bit awkward, visually as well as vocally. Not all women manage to scale down the voice to a boy’s dimensions. 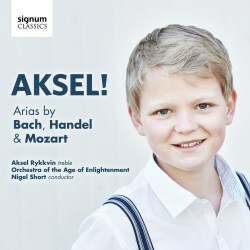 Aksel not only sings the arias as well as any soprano but also depicts the character so believably. I am running out of superlatives, but I must add that the Orchestra of the Age of Enlightenment provide wonderful backing and there are important instrumental solos. Besides David Blackadder’s three trumpet solos, Luise Buchberger plays a piccolo cello solo in Bach’s Mein gläubiges Herze and Katharina Spreckelsen’s oboe d’amore is heard in the beautiful Quia respexit from Bach’s Magnificat. If you are going to buy just one more CD this year, make sure that it is this one.